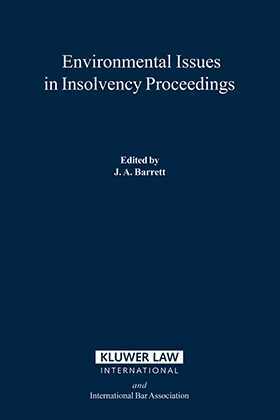 This book offers an up-to-date analysis of the treatment of environmental issues in bankruptcy and insolvency proceedings in six jurisdictions: Canada, Denmark, Germany, Spain, the United Kingdom, and the United States. The papers codified in this book represent expansions of those presented at the successful October 1996 meeting of the Section on Business Law of the International Bar Association. The contributors outline the environmental concerns and legal issues within their jurisdictions and address the insolvency issues that arise and the impact of environmental concerns. Each paper is organised into numbered topics and subtopics, making the work accessible as a reference. The book also includes useful insights from a major international bank -- Bank of Nova Scotia -- into the handling of international credits where environmental concerns are raised in insolvency proceedings.